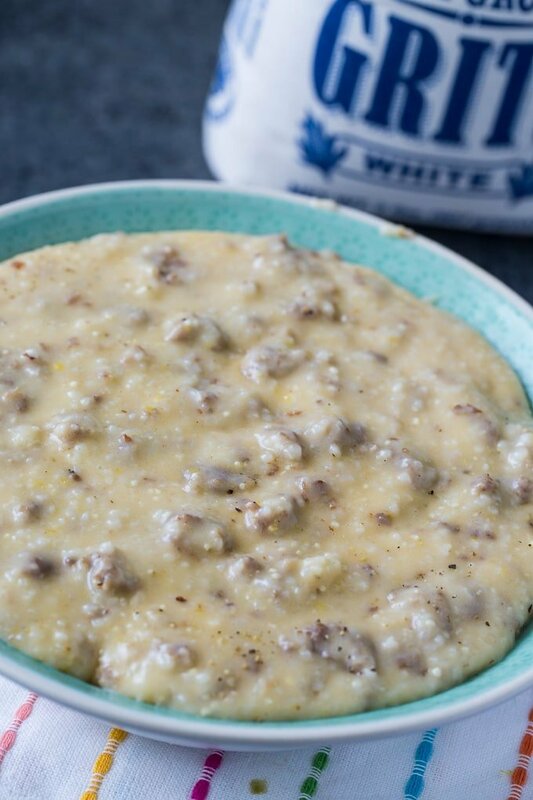 Instant Pot Sausage Grits are full of ground breakfast sausage and seasonings plus cheddar cheese. They are so creamy and rich and the sausage elevates them to a whole new level. 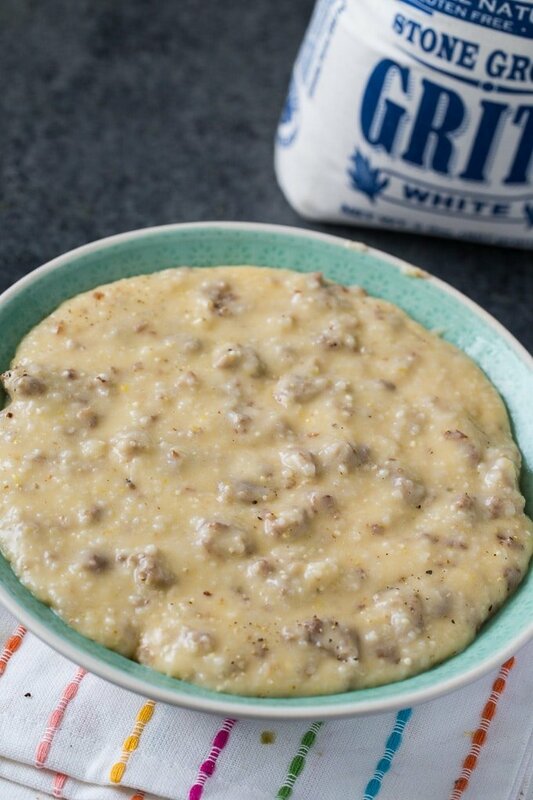 Made with stone ground grits, these Instant Pot Sausage Grits have such an awesome texture. The Instant Pot makes cooking stone ground grits (which can take up to an hour normally) much quicker and easier. There’s less time involved and no stirring. Got to love that! For stone ground grits, I like to use Palmetto Grits. 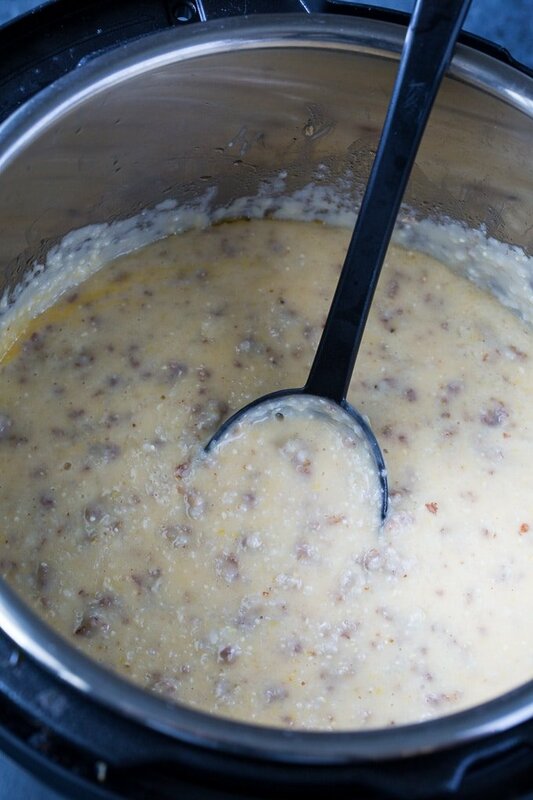 To make Stone Ground Grits, use the “saute” mode on your Instant Pot to brown and crumble one pound of breakfast sausage. I typically use Jimmy Dean sausage. You can use mild or hot sausage. Whichever one you like best. Once the sausage is cooked, turn the Instant Pot off and add 1 cup of grits, 3 cups of water, 1 cup of half-and-half, salt, and garlic powder. You could use milk or even heavy cream instead of the half-and-half. Stir everything. Place the lid back on and pressure cook for 10 minutes. Let the pot do a natural pressure release for 15 minutes. Release the remaining pressure and open the pot. Stir in the butter, cheddar cheese, and garlic. And get ready to dig into the most delicious grits you’ve ever tasted! For a full southern breakfast, make this easy biscuit recipe to go with the grits! Lightly grease the inner pot of your Instant Pot. Turn on "Saute" mode. Add sausage. Crumble it apart with a wooden spoon as it cooks. Once sausage is cooked and crumbled, turn Instant Pot off. Add grits, water, half-and-half, salt, and garlic powder. Give everything a stir. Place lid on pot and make sure valve is in "Sealing" position. Turn Instant Pot on "Pressure Cook" for 10 minutes. Let it release pressure naturally for 15 minutes and then open the valve to release remaining pressure. Carefully remove lid. Stir in butter, cheese, and pepper. Check for seasoning and add more salt if desired. 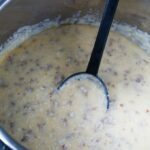 This entry was posted in Breakfast, Instant Pot and tagged grits, Sausage. Bookmark the permalink. can instant grits be used?